Sweet Irony or Logical Conclusion? Is it sweet irony or just living life to its logical conclusion when a retired cop becomes a pig farmer? As I ponder that question I find it a bit amusing that the phrase "pig pile" was a part of my vocabulary as a young policeman and has now made a reprise in my new career. Then, it referred to a number of cops piling onto a suspect that did not want to go peaceably. Now, the meaning is more literal and refers to the natural tendencies of young pigs to lie close together for warmth. It is also ironic that calling someone a pig is used so derisively as these animals are undoubtedly the cleanest (though you wouldn't know it to look at them), most intelligent and most lovable of all the barnyard animals. Not to mention the tastiest. At any rate, we love raising pigs and this years' batch is now available to order by the half or the whole at $3.50 per pound hanging weight. A $100 deposit is required to confirm your order. Additionally, you pay the butcher $.55/lb for cutting and wrapping. They will be harvested around mid or late October and will be processed at Butcher Boys in Vancouver,WA. They cure the hams and bacon without nitrites. And of course we raise them humanely, naturally and without chemicals. Our guests love watching the pigs frolic, wallow and root. Some even love to get in the pen and help with the feeding. One recent guest could easily be dubbed the "pig whisperer" for her ability to charm them. It took me a couple of weeks to get them to warm up to me. But then again she is prettier than me and smells better. Have any of you ever raised pigs? Do you have some stories to share? 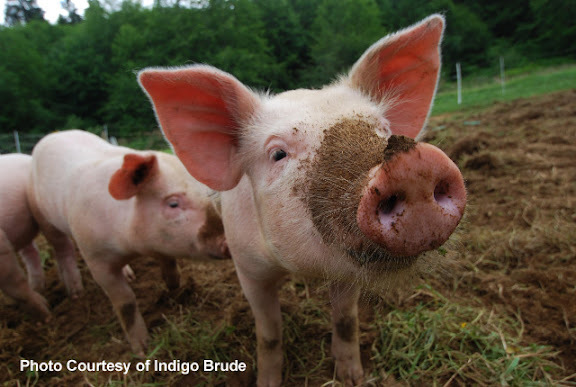 Have you tasted pasture raised pork ? The meat is denser and more pink in color rather than being "the other white meat."